There is a tendency within football, as with most sports, for top level coaches to have learnt from a peer or mentor at an early age. The term coaching tree is perhaps more prevalent in American sports, American Football in particular has seen a plethora of coaches and front office executives who have learnt their trade under the current New England Patriots head coach Bill Belichick before going on to work elsewhere in the NFL, the same however can be applied to football. For example the legendary Dutchman Johann Cruyff is naturally, and deservedly, regarded as one of the fathers of modern football, Cruyff however learnt from his coach with Ajax and Holland Rinus Michels. The trick for talented coaches is to learn what they can from mentors and then apply these lessons in combination with their own football game model. One of the more interesting, and perhaps under the radar, coaches in European football at the moment is the Austrian coach Adi Hutter, currently in charge of Young Boys in the Swiss Super League. Hutter has previously coached SV Rheindorf Altach, SV Grodig and Red Bull Salzburg in his homeland before moving to Young Boys in 2015. It was his time at SV Grodig however in which his tactical blueprint began to emerge. The Austrian coach prefers his side to play from a 4-4-2 platform but in the attacking phase the system very much resembles the 4-2-4 utilised by the German coach Roger Schmidt during his spell in charge of Red Bull Salzburg, he favours a high tempo, high pressing system with his sides looking to swarm the opponents as they look to transition from defence to attack. In this the influence of not only Schmidt but also Ralf Ragnick and Helmut Gross is evident. Together Ragnick and Gross were responsible for the tactical shift in German football away from the libero, man marking system to zonal marking, high pressing and four at the back. 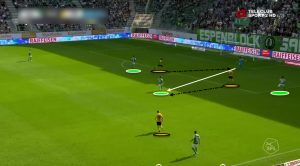 I have spent this watching Hutter’s Young Boys play this season in order to better understand his tactical blueprint. As previously mentioned Hutter prefers a structure starting from a base of 4-4-2. Unlike the traditional variant of this system however the wide midfield players play a far more advanced role in the game. The two centre backs and the two central midfielders form a relatively static base from which Young Boys can build whilst the full backs, wide midfielders and forwards are more fluid with their movement and positioning. The central theme of the structure under Hutter seems to be maintaining a strong core whilst using movement in to different areas of the field in the attacking phase to create opportunities to overload and play through the opposition. Here is a structural example that we see of the side in the established attacking phase of play, I have however made an error with the ball near (left sided) centre back, in this position he would usually more across to occupy the half space in order to provide a support option for the fullback in possession of the ball. As you can see the two central midfielders tend to hold their central positions in order to facilitate safe ball circulation from the left side to the right side of the field or vice versa. The key however lies in the movement of the ball near wide midfielder, he will tend to move in to the half space in this position in order to both open up space wide for the full back to advance and to create the opportunity to overload that side of the field against an isolated defensive player. The two forwards then make a lot of movements around the edge of the penalty area in order to create passing lanes and angles in spaces around the opponents defensive structure. Finally we have the typical defensive structure that Hutter favours. The 4-4-2 structure lends itself to a compact defensive shape and plenty of partnerships throughout the team. These partnerships lend themselves to defensive support and make it difficult for the opponent to create opportunities to overload isolated defensive players in your defensive system. Once again the two central midfielders are key, they tend to both be characterised as hard working players who move well horizontally across the field, this allows the midfielders to negate any potential passing lanes that the opponent could use to penetrate the centre of the compact defensive structure. These movements between variants of 4-4-2 and 4-2-4 lend themselves to collective play and Young Boys rely more on the team dynamic than they do on individual brilliance in order to break teams down and win matches. I have shown you the structures that Adi Hutter favours for Young Boys but to understand them fully I find that it is often best to provide examples in game so that people can interpret the shapes that tactical systems make on the field, especially in relation to the opposition. Here we see an example of the attacking shape from Young Boys as they enter the oppositions half of the field. The first thing to note is the strength in terms of shapes and partnerships on the ball near side of the field, the left back, left midfielder, left sided central midfielder and left sided forward have combined to form a diamond. In effect this ensures that the man in possession of the ball always has a passing option, either safe, or adventurous. The safe passes for the man in possession would be to either the wide or central player whilst the more difficult, but perhaps more effective pass would be to the advanced player. Indeed with this positional movement Young Boys have fashioned a rondo that will be either 4v2 or 4v3 depending on the movement and positioning of the defensive player. We can also see ball far (right sided) player who has kept a wide position and offered a chance to switch play quickly in to a potential isolated situation against his direct opponent. This time we see the defensive shape as the opposition look to build down the Young Boys right hand side. Immediately we have eight defensive players who are compact on that side of the field. This compact structure offers both depth in terms of positioning and pressure on the man carrying the ball but also on other players who could potentially be in a position to receive the ball. The effect of this defensive positioning is to smother the opposition and force them either to turn the ball back towards their own goal or to try and force a path through the defensive structure. As with so many other sides that favour gegenpressing (counter pressing if you prefer) Young Boys, under Adi Hutter, are not a possession orientated side. Instead they favour vertical passing that is designed to attack space and weakness in the oppositions defensive structure. In order to manage this effectively we need for two things to happen, firstly, the man in possession of the ball needs a variety of options to which he can pass the ball in order to vary and diversify the angle and depth of the attack, secondly there needs to be movement in the final third to create space that can be exploited. Firstly we have an example showing the options that are open to the man in possession of the ball. Here you can see that as the central midfielder collects possession in space he has five immediate options to either play the ball vertically or horizontally, never backwards if it can be helped, this means that the weak point of the opponent can be identified and the ball can be played to a player or an area that is best placed to exploit this weakness. Young Boys are extremely adept in shifting the emphasis of the attack across the width of the field to create overloads or isolated 1v1’s against their opponents. Here the key lies in the movement of the right sided midfielder who has vacated the wide zone and moved in to the half space. This simple piece of movement has two key effects on the attacking phase for Young Boys. First of all it narrows the defensive structure of the opponent with defensive players attracted in towards the wide players movement and secondly it creates space along the wide vertical lane in to which the full back can move. In this instance the fullback is able to move in to the wide area and collect a pass from the central midfielder in plenty of space. Again, as with most gegenpressing sides Young Boys press their opponents high as they look to move in to their initial attacking phase. The two forwards and ball near wide midfielder will typically take up man marking positions as the opposition look to restart play from the back, they then press relentlessly to try to force the opponent to make a mistake. Here we see an example of the front two trying to pressure the opposition goalkeeper to force a mistake, in this instance the goalkeeper has the numerical advantage ahead of him and in playing the vertical pass through the press he things that he has put his side in an immediate advantageous position. Instead one of the forwards immediate pressures the receiving player and forces an immediate turnover, his striker partner is then able to collect the ball and score past the goalkeeper from the edge of the penalty area. Here again the two forwards instigate the pressing movement. As one player presses the man in possession the ball is then passed back to the goalkeeper, note the wide midfielder for young boys who is positioned to press and cover the left back for the opposition. As the goalkeeper takes possession of the ball he is then pressed in turn by the second forward and he hits a rushed pass out of play deep in his own half, immediately giving impetus to Young Boys. Adi Hutte left Red Bull Salzburg on something of a sour note with the Austrian side failing to build on their potential under his supervision. With Young Boys however the Austrian coach has landed on his feet, he has an environment and group of players that seem to have bought in to his footballing philosophy. The only question is how long he chooses to stay at the Swiss club with plenty of other clubs and front office executives around Europe becoming aware of his impressive brand of football. Surely it is only a matter of time before a club from Germany comes calling, would a move to his footballing homeland be too good to turn down?